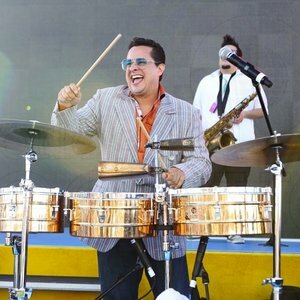 Pillow Talking’s Interview with TITO PUENTE JR. 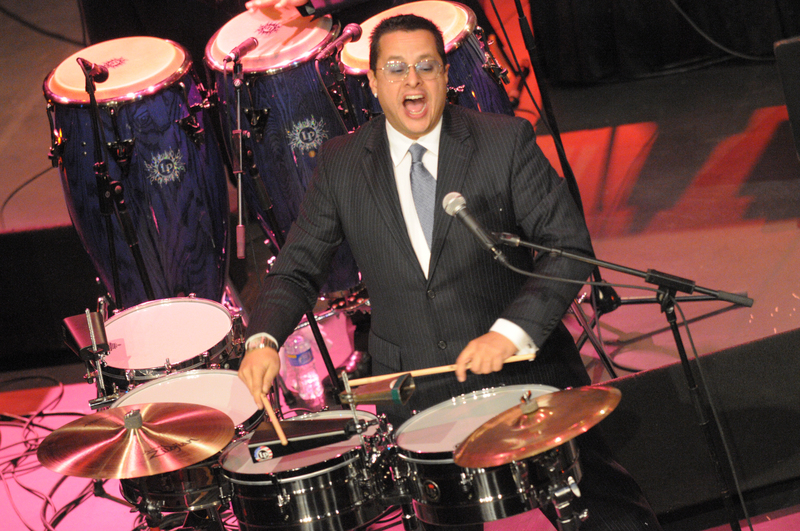 Someday Productions LLC and Pillow Talking are pleased to present the following interview with TITO PUENTE, JR. The elder Tito Puente, often referred to as The King of Latin Music, was a certified legendary musical performer and entertainer. His incredible contribution to Latin jazz music and his legacy is kept alive through his multi-talented son, Tito Puente, Jr. Like his father, Tito Puente, Jr. is a composer, performer, musician, and bandleader who has contributed so much to the evolution of Latin jazz music. He also is an actor with a number of films under his belt. Pillow Talking was thrilled to have the chance to catch up with this incredible talent and share his thoughts on performing, being the son of a musical legend, and the music business in general. PT: Thank you so much for granting Pillow Talking (Stephanie and Wayne) this interview. We have seen and reviewed numerous shows which play tribute to famous icons. There is no question that your father is a legend in the musical industry. In recent years, we’ve had the pleasure of experiencing many that involve family members who offer the tributes including Frank Sinatra, Jr., Louis Prima, Jr. (who also has played at the Palace Theatre in Danbury), and most recently Gunnar and Matthew Nelson of the Nelson Band in a tribute to their father, Ricky Nelson. What made you decide to do a tribute to your father? TPJ: I have been tributing my late father for years now. I continue to keep his legacy alive for the young kids today. I believe that his memory is crucial to the development of new Latin music in this industry. PT: So true! Can you describe your show for us? TPJ: It is exciting and a learning lesson about my father’s career. I take the audience through a journey of mambo music and arrangements from my father’s repertoire. It is a time capsule of up tempo mambos and cha-chas from the 1950s. PT: It sounds like such a fabulous and fun time. What do you hope the audience takes away from your show? TPJ: I encourage everyone to dance and enjoy good music in a presentation that you can take home with you and share with your family. The entire concert is family-friendly and danceable. PT: So tell us, how did you get started in the business? TPJ: Of course, my father was already an established performer in the Latin music world. I always played the drums and enjoyed playing with a heavy metal band. That was my first love of music. I started performing Latin music went I went on the road with my father and started feeling that clave rhythm that he was playing. 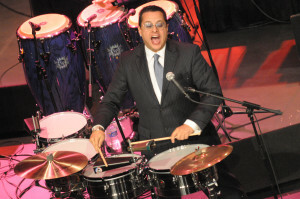 I gravitated towards that groove and took my percussion playing into the Latin music world. PT: Have you had formal musical training and if so, what? TPJ: I took percussion lessons from the great Sam Ulano who was an incredible drum teacher. Most folks would believe that it would have been my father, Tito Puente, who would have taught me some drum playing but that just not true at all. My father encouraged me to go to school and learn, plus take lessons on how to read, play, and write music. Today I am truly grateful for that, as I respect all musicians that have these skills and talent as well. PT: Can we take that to mean your family was supportive of your musical endeavors? TPJ: Yes. they were supportive and encouraging, but of course as any parent would, they made sure I got my education. PT: Of course, and so wise! What advice, if any, did your father give you about the business? PT: What was it like growing up the son of a musical icon and legend? TPJ: A little bit difficult at time since my dad wasn’t home a lot. His absence made me want to be with him more and my mother encouraged me to take tours with him. I’m grateful that I got to have those opportunities to experience his travels around the world. He was my dad first, then a musician. PT: And those are memories you’ll always have. What advice do you give young performers starting out today? TPJ: I tell them to learn to read and write music. Stick to your craft and will find your calling especially a live musician looking for a gig. PT: So important! What’s on your future agenda both personally and professionally? TPJ: A lot of touring. I also have a new single coming out in June with a fantastic singer named Melina Almodovar. It’s a tribute to the Latin singing legend La Lupe and to my father. We are wrapping up the mix now and shooting a music video next month. I will be in the National Puerto Rican Day Parade in New York City on Sunday, June 11 on the Goya float and debuting the new song with Melina. Very new and exciting things to come this summer. Follow my social media for updates! PT: We will – it all sounds so fabulous! So if you weren’t involved in music, what do you think you might be doing today? TPJ: I really like the forensic field. I think I would have become a mortician or work at a morgue. I know it sounds morbid especially from someone who performs happy up tempo music but I find it fascinating and I respect the field. PT: Wow! (Laughs) That’s not something you hear every day! Can you tell us your opinion about the changes are in today’s musical landscape and what impact have they had on musicians? TPJ: There are different genres now in Latin music. I try to keep focus on what I’m doing and what is the trend or favor of the month. Live music will always have a place in this world. A musician can have a full career in performing live in front of an audience. But it’s kinda hard to see a 75 old DJ if you know what I mean? PT: Yeah! What about the impact of social media on the music industry and how has it affected you? TPJ: I think it has been good and I’m glad that we can now see live concerts and show backstage footage with artists. The fans want to see this so I enjoy giving them this insight that they otherwise wouldn’t be a part of. PT: That is so true – what a great way to connect with fans. One thing our readers always want to know is about the process and technique of the creative arts. Do you have one? How do you approach a project? TPJ: I have over 10,000 arrangements where I look to pick from. It’s hard to pick the right ones but I make sure that I get the input of which ever singer or producer I’m working with. From there the songs take on a life of their own. PT: That’s a great vault. Tell us, if you had one wish, what would it be? TPJ: Peace on Earth and mambo music for the masses. I’m also aiming for that Grammy Award, too! PT: That’s three, but hey! Why not! (Laughs) This has been a great interview! Thank you so much! So now for our “signature” question. Pillow Talking likes to torture its interviewees (laughs). If you were to sum up your life and career thus far in one word, what would it be? PT: Thank you! Well, we’re certainly glad you’ve accomplished so much. We know that the show at the Palace will be a great success and we wish you all the best in your upcoming endeavors!